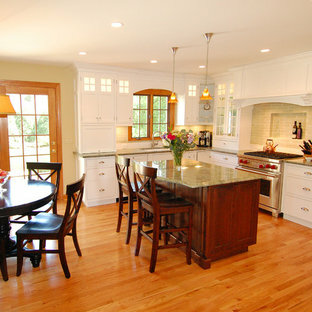 Large white kitchen with granite topped island and custom kitchen table built in. Custom blue beaded Ro Sham Beaux chandelier, along with high hats give lots of lighting options. Custom arched frames over windows mirror the arched windows in the attached family room. 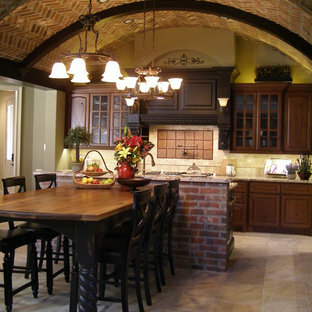 Open, warm and welcoming-is this full loaded kitchen. 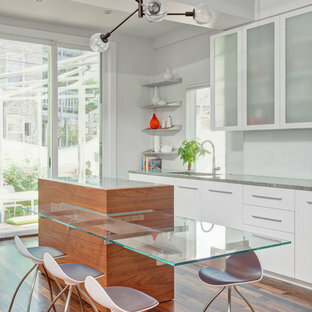 The hand finished walnut bar is a favorite gathering place. Not shown is an attached 'morning room' that is well used for the day's first cup of joe! Inspiration for a contemporary eat-in kitchen in Chicago with flat-panel cabinets, white cabinets, medium hardwood floors and an island. Inspiration for a mid-sized transitional l-shaped eat-in kitchen in Dublin with white cabinets, an island, an undermount sink, shaker cabinets, white splashback, black appliances, grey floor and yellow benchtop. A unique and innovative design, combining the requirements of regular entertainers with busy family lives looking for style and drama in what was a compact space. The redesigned kitchen has space for sit-down meals, work zones for laptops on the large table, and encourages an open atmosphere allowing of lively conversation during food prep, meal times or when friends drop by. The new concept creates space by not only opening up the initial floor plan, but through the creative use of a two-tiered island benchtop, a stylish solution that further sets this kitchen apart. The upper work bench is crafted from Quantum Quartz Gris Fuma stone, utilizing man made stone’s practicality and durability, while the lower custom designed timber table showcases the beauty of Natural Calacatta Honed Marble. Design ideas for a large beach style eat-in kitchen in Minneapolis with white cabinets, marble benchtops, white splashback, ceramic splashback, stainless steel appliances, dark hardwood floors, an island, brown floor, glass-front cabinets and grey benchtop. 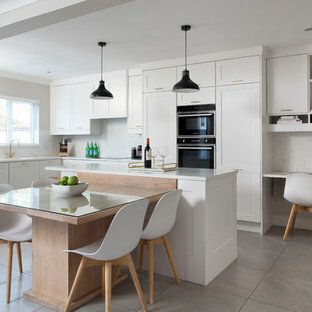 Contemporary single-wall open plan kitchen in Berkshire with flat-panel cabinets, light wood cabinets, black appliances, light hardwood floors, an island and beige floor. This contemporary kitchen has some unique features. 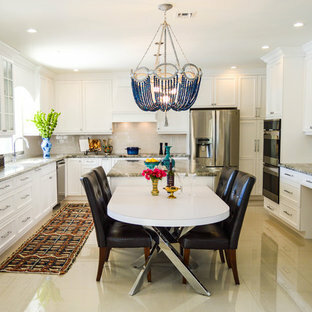 The island has 3 levels – a lower level Calcutta marble countertop for prepping, rolling, or mixing; a mid-level with the same height and material as the main perimeter countertops (Caesarstone “Blizzard”); and a slightly higher level made with a custom-designed maple table that fits over the end of the island counter. Although the custom table required extra time and consideration, the challenge to design it was well worth it. It is a pivotal element in the space and is both highly functional and aesthetic. 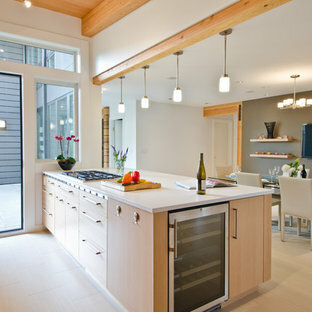 Its inventive flexible design allows it to be moved to any side of the island. Moreover, by simply adding a leg, it easily converts into a free-standing table that can be positioned anywhere in the room. This flexibility maximizes its versatility. It can be arranged so guests can dine in close proximity to family members or it can be relocated where food and drinks can be served off to the side and out of the way. The table’s custom maple finish ties in well with the existing fireplace and bookshelf in the sitting room. Inspiration for a mid-sized tropical l-shaped eat-in kitchen in Boston with white cabinets, quartz benchtops, multi-coloured splashback, stone tile splashback, stainless steel appliances, light hardwood floors, an island and shaker cabinets. Mid-sized traditional l-shaped eat-in kitchen in Charlotte with an undermount sink, recessed-panel cabinets, white cabinets, multi-coloured splashback, stainless steel appliances, light hardwood floors and an island. Inspiration for a transitional galley eat-in kitchen in Atlanta with stainless steel appliances, an island, an undermount sink, shaker cabinets, black cabinets, white splashback, medium hardwood floors, brown floor and grey benchtop. This contemporary home is a combination of modern and contemporary styles. With high back tufted chairs and comfy white living furniture, this home creates a warm and inviting feel. The marble desk and the white cabinet kitchen gives the home an edge of sleek and clean.